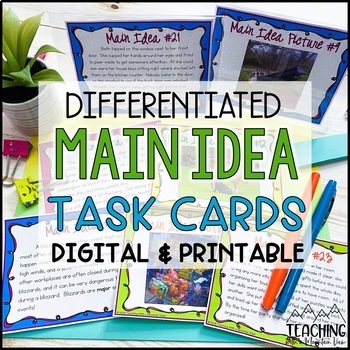 A set of 52 Differentiated Main Idea Task Cards with activity sheets and main idea statements for easy differentiation. 32 Paragraph Task Cards and 20 Picture Task Cards. 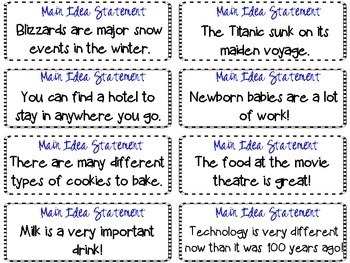 There are 32 paragraph scenario cards to use for generating and discussing main idea and detail statements. The students read the paragraph and generate a main idea statement (See preview). Students then pull a detail from the paragraph to write one detail that supports the main idea. 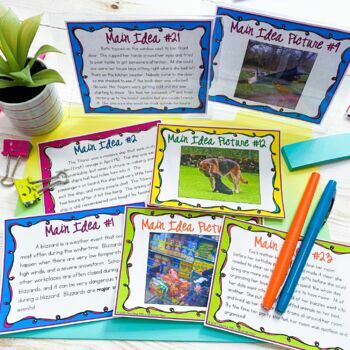 Take it a step further, and the kids can create a title that belongs with the picture to show their understanding of how titles often support main ideas. I have included Main Idea Statement Cards at the end of the cards for students who need extra help in determining main idea. Cut out the cards and then have students match the main idea statement to the picture card. You can also buy this as part of my HUGE Reading Skill Task Card Bundle! Are you looking for more in-depth main idea task cards? 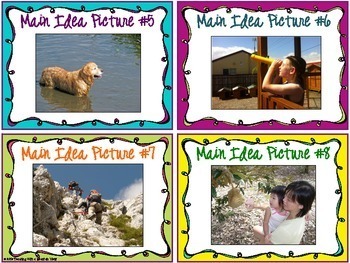 Check out my Main Idea vs. Theme Task Cards! Even MORE Reading Skills Task Cards!